Just push the run arrow and your analysis will begin. ORACLE is the first ever rapid fat analyzer that requires absolutely no method development. At the touch of a button. ORACLE can analyze fat in any food sample with reference chemistry accuracy, without any prior knowledge of the sample matrix and composition. 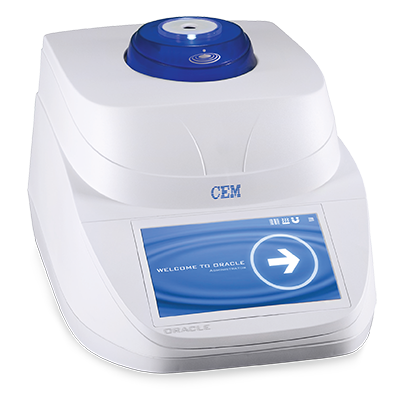 Simply press the run arrow and in 30 seconds the ORACLE delivers an exceptionally accurate and precise fat result. It’s really that simple. ORACLE was verified with over 30 Certified Reference Materials (CRM’s) sourced from Europe and USA. These trusted samples undergo extensive reference testing in numerous certified laboratories and provide a benchmark for any food testing methodology. The blue data in the graph shows the linearity between the CRM reference results and the ORACLE rapid fat results. 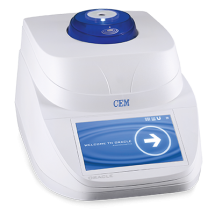 Since CRM’s are limited in their available matrices, CEM also outsourced hundreds of samples to third party testing laboratories for wet chemical reference chemistry analysis. The red data in the chart shows the comparison between the outside lab reference results and ORACLE.